Maya Angelou was moved to tears while reading a passage of her new autobiography "Mom & Me & Mom," in an interview for "This Week,"
"There has never been anyone greater than you as the mother of a young adult. She squeezed my hand twice," Angelou read aloud to ABC's Susan Saulny. Angelou was overcome with emotion, sharing stories and memories of her mother, who is the inspiration for her new book. "I can't read anymore … I can't. She's still very much with me," Angelou said. "I have a photograph of her in my bathroom on the mirror, so each morning when I go in there to brush my teeth I see her, smiling and looking at me, and approving of me." Though Angelou has written several autobiographical books, this is the first time that she reveals the triumphs and struggles of her relationship with her mother. "She was so beautiful. My brother and I, we would watch her carefully, as if she was a butterfly," Angelou said describing her mother. Angelou said her mother helped her to realize her potential to become something great. Her mother said, "Baby wait a minute. I think you're the greatest woman I've ever met // and I thought, suppose she's right? Suppose I'm going to be somebody? Goodness." She was right. Last Wednesday at the National Book Awards ceremony Angelou was awarded with the Literarian Award for Outstanding Service to the American Literary Community. She has written 16 books, has won dozens of awards, and has actively fought for civil rights throughout her career. "We have come a long way. We have to say that. Otherwise, the children will say, you mean, tell me we're - the lives and deaths of Dr. King, Malcolm X, the Kennedys, you mean to tell me we are no further along?" Angelou said. Angelou speaks with a sense of forward-looking hope and a contagious kindness, perhaps something she learned from her mother. 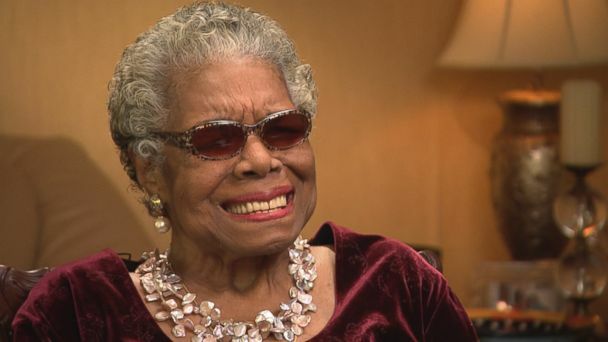 WATCH an extended Power Players interview with Maya Angelou. "Forgiveness is the greatest gift you can give yourself. It's not for the other person," Angelou said. "You must forgive. It's for your own sake. To rid yourself of that weight…That's the answer."